Born in Alexandria, Egypt in 1938, Mostafa Abdel Moity got his degree from the Academy of Fine Arts in Alexandria (Department of Painting) in1962, and immediately began teaching as a faculty member at the academy and has continued to ever since. Of his many impressive posts and vibrant curriculum Vitae, perhaps his most prominent were Vice President of the World Congress of Contemporary Art in Venice in 1985 the same year and the Head of the Egyptian Academy in Rome in 1988. 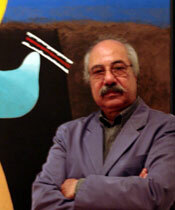 Mostafa Abdel Moity's early works had touches of the figurative and the recognizable, with his style developing and evolving into distinctly abstracted paintings and sculptures characterized by aggressive bold lines and block of vibrant colors, underlined by the expert use of shade and light that gives depth and meaning to his canvases. Circles, triangles are used extensively in his work, together with other geometrical patterns, evoking notions of outer space and infinity.